Heat the olive oil in a frying pan. Add the onion and serrano pepper, and cook until the onion is tender and translucent. Put the onion in a deep, microwave-safe container. Add the ham, cream cheese, mustard, mayonnaise, green onion and 2/3 of the cheese. Stir well. Sprinkle the remaining cheese over the top and microwave for 1-2 minutes or until the cheese is completely melted. To prepare your own totopos, or crispy tortillas chips, leave the tortillas outside the refrigerator on a baking sheet overnight so they dry out. Cut them in the desired size and fry them in super hot oil until golden brown. In my family, for formal celebrations, I always prepare baked ham. We almost always have leftovers, and for a few days we prepare ham sandwiches. Today, I’ve prepared a fun and practical recipe to help you put your baked ham leftovers to good use. 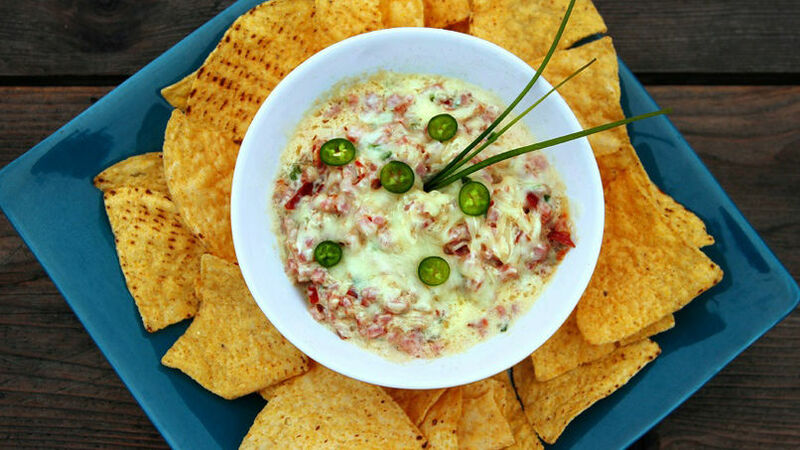 This ham dip is easy to make and perfect for any gathering; serve it with tortillas or tortilla chips. My only advice would be to check how salty the ham is: if it’s saltier than normal, use salt-free tortillas, of fry the tortillas at home and don’t season them with salt.